The Quintuple Quasar SDSSJ1029+2623 has been gravitationally imaged by an intervening cluster of galaxies. Astronomers have detected time delays between flaring events in the quasar, the result of the light in different images traveling along different paths in space. Quasars are galaxies with massive black holes at their cores around which vast amounts of energy are being radiated. Indeed, so much light is emitted that the nucleus of a quasar is much brighter than the rest of the entire host galaxy, and their tremendous luminosities allow quasars to be seen even when they are very far away. The quasar SDSSJ1029+2623, for example, is so distant that its light has been traveling towards us for 11.4 billion years, 83% of the age of the universe. This quasar is particularly unusual because it happens to have five quasar neighbors in the sky that look very similar to it and moreover are located at the same cosmological distance. SDSSJ1029+2623 is actually a gravitationally lensed quasar. Its light is being magnified and distorted by the gravity of a cluster of galaxies fortuitously lying between us, in accordance with Einstein’s prediction that light can be bent by gravity. Only a few other quasars being gravitationally lensed into multiple images by clusters are known. Over fifty years ago, astronomers predicted that in such cases, because the light from each image travels along a different cosmological path, any time delays between flaring events in the images can be used to probe underlying cosmological parameters such as the age and rate of expansion of the universe. Moreover, these delays can also probe the surface density distribution of the lens. Such delays have now been detected, with the longest delays being of the order of a few years. In the case when individual galaxies (not clusters of galaxies) act as lenses, the time delays are more often weeks or months. CfA astronomer Matthew Bayliss and four of his colleagues undertook a campaign to monitor the time delays in the images of SDSSJ1029+2623 using the 2.56-meter Nordic Optical Telescope in the Canary Islands, Spain. Over three years of systematic observations they found a delay of 722 days between the image whose light is predicted to arrive first (“image C”) and the component that is brightest, and a 47.7 day delay between the two brightest components. Fortuitously, during this period image C underwent a sharp flux increase, and models predict that this event should be spotted in the other five images in the next few years. The data are not quite good enough to refine any cosmological parameters, at least not yet, but the team is continuing close monitoring of the quasar and hopes to determine with precision the timing delays in all six components over the next few observing seasons. 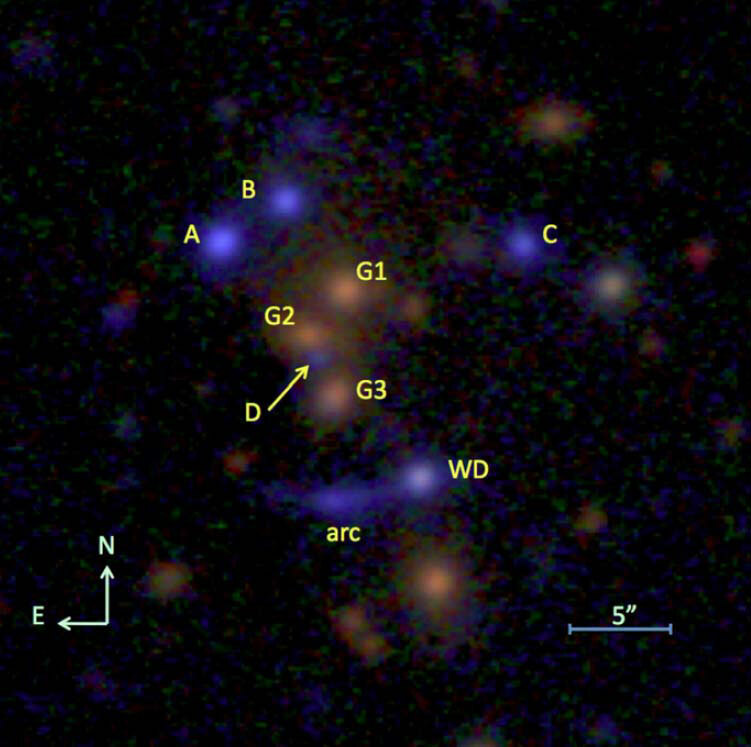 Be the first to comment on "Astronomers Detect Time Delays between Flaring Events in a Quasar"